← Hello. My name is…. I loved teaching women’s studies classes. Just this summer I heard from a former student that my class from over twenty years ago transformed her life. She’s now an Associate Dean of Business at a big university in New Orleans. But after twenty years I was ready for something different. Writing academic stuff was always hard for me. In contrast I found the freedom of fiction writing exhilarating. When Debby Gilbert told me she loved my first romance (The Red Halter Top), I was hooked. One of my rewards now is that I have my women characters face difficult situations but succeed and thrive. When did I become serious about writing romantic fiction: My first exposure to non-academic writing was a workshop at my university on writing memoirs. I drafted one, but never finished it after Katrina overturned all our lives in New Orleans in 2005. Several of us academics formed a writers group that exposed me to all kinds of seminars, conferences, and the Romance Writers of America. 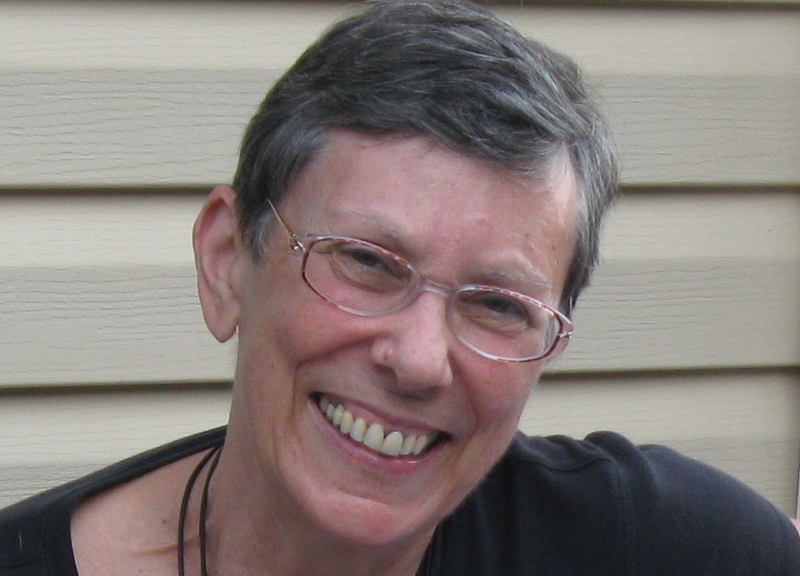 The Red Halter Top resulted from the local RWA chapter’s writing challenge. I wrote the novella in a month and published it in 2013. Since then I had two romantic suspense stories published in 2014, and another accepted this Spring. My writing process: Most importantly, I strive to write every day. A yellow stickie on my desk says “Write First,.” and another pink one says “Write Every Day.” I write in the morning when my household is mostly quiet. Our three dogs finally settle down, and the parrot stops complaining. I need quiet to focus. 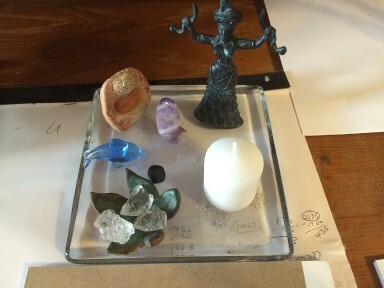 I have a tiny altar on the desk – with a votive candle I light, a few crystals sitting on a small ceramic leaf, a tiny crone figure, a small statue of a Goddess found in the ruins of Knossos in Crete, a tiny amethyst penguin, and tiny blue dolphin from Sicily. These items inspire and comfort me. 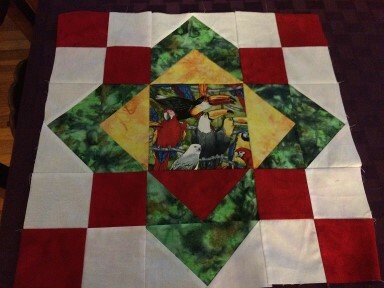 Hobbies: I’ve always loved to sew and fell into quilt making while still on the faculty. Current quilt is for my daughter and her partner. Across the years I’ve made over twenty quilts, mostly for family members and for our beach rental house on the Gulf. In addition I crochet. 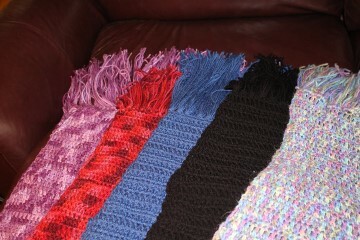 My favorite pattern is a Prayer Shawl http://www.shawlministry.com/crochet_patterns.htm. These are made with a prayerful intention for the well-being of the recipient. Both are satisfying hobbies because you have a tangible result in your hands. Publishing either academic articles or romance novels is a long process—sometimes a year or more before stuff is in print. With my hobbies I have something to show for my efforts today. Current Work: I’m currently working on The Tenure Scandal, a sequel to The Jury Scandal. The protagonist is a women sociology professor (big surprise). Her husband is a homicide detective she met in the first book. In this story she’s drawn into the intrigue of the history department where professors are being killed, apparently to eliminate competition for tenure. Inspiration comes from all over the place. Often I include crimes that have been in the news. The most fun inspiration I’ve had is with the plot for The Taste of Her, my most recent publication. I have an Idea folder where I intend to stick scraps of possible stories, meaningful quotes, and images that catch my attention. Ready for a new manuscript last year, I opened the folder, anticipating a treasure trove of goodies. There was one yellow stickie in the otherwise empty folder with the phrase, “he loved the taste of her skin.” In a flash, the whole story appeared—a villain who licked women’s bodies before stabbing them, a woman homicide detective who chased this creep and was almost his victim. Published last December, the wonderful cover and blurb are here. 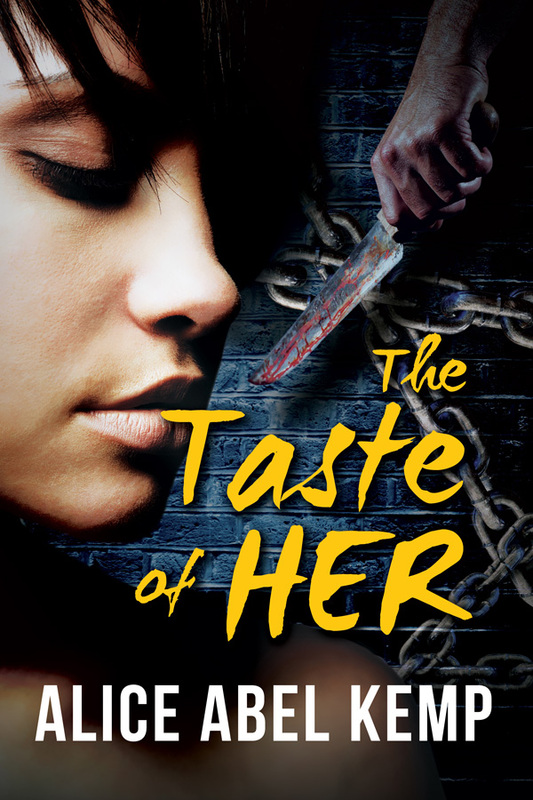 THE TASTE OF HER is the story of Margaret Angelo, a New Orleans homicide detective. Despite the sexism of the NOPD, she works to catch a serial killer, the Slasher, who kidnaps women, assaults them, and gets off on licking their bodies before he kills them. Although devoted to her job, Margaret longs for a life partner. She reconnects with a high school acquaintance, Jim, whom she hires to paint her house. They begin a relationship, but Margaret is kidnapped by the Slasher and faces certain death. The other detectives manage to rescue her, but the Slasher escapes their trap. He is losing control and hunts Margaret down, determined to finish her. With Jim’s support, can she escape this mad man? Thanks so much for visiting with us today, Alice! And best of luck with your newest writing ventures! This entry was posted in 2015 August Blogathon, Soul Mate Publishing and tagged Alice Abel Kemp, contemporary romance, friendship, goals, heroes, Imagination, inspiration, road to publication, Soul Mate Publishing. Bookmark the permalink. 26 Responses to Alice is in the House! Please Welcome Alice Abel Kemp to the Blogathon! You’re an amazing writer, Alice! I thoroughly enjoyed learning more about you through this interview. 🙂 Can’t wait to read your campus mystery– The Tenure Scandal. Thanks for checking in, Kate. Watch my FB page for publication news. Have a great day. And thanks for reblog, Neva. You have a beautiful website. Reblogged this on Alice Abel Kemp's Blog. Congratulations Alice on bringing your academic knowledge to your fiction writing and creating strong female characters. Do you continue to teach? Welcome, Aliceakemp! I look froward to reading your future blogs! Thanks, Karen. Appreciate your stopping by. Hi Alice! I’m always so happy when news about you pops up in my email! It looks like you’re doing so well – congrats! Loved learning more about you and the book sounds scarey and fascinating. I love the fact you have new career now with the writing. I have been lucky to meet so many wonderful people since string to write romance. I guess new careers are a benefit of getting older. (-: Refuse to say that I’m old, however. I can’t believe you wrote your first novella in a month!! I’m ordering it now because I love the title. I, too, worked at a college for many years, albeit in administration. You are really on a roll with your writing. I love your “Write First” sticky note. That must be my problem. I do everything else first. Congrats and thanks for the motivation. Thanks, Beth. I didn’t say how long it took to edit it. (-: universities are great places to work for the most part. I was treated well, but not well paid. Combined with all the hassle, it stopped being worth it. Appreciate your stopping by. Alice – thank you for sharing. It’s great to learn more about you. I taught Gender/Women’s Studies as well, several years ago as an adjunct instructor. I love the subject, and I find it influences my heroines’ choices when I write. Alice, The Taste of Her was one of the best books I have read all year. It was seriously addictive reading. Lovers of scary romantic suspense need to read this novel. Congratulations Alice on your prolific writing career! I remember very well the first work I ever read of yours – an op/ed piece in our New Orleans newspaper, less than one year after Hurricane Katrina. I contacted you via the email address you provided at the end of it, told you I always wanted to write but had no support system, and you invited me into your writer’s group with open arms. I learned so much from you back then and still do. Continued success to you! That is an excellent achievement Alice finishing your first novel in such a short time! Looking forward to reading The Taste Of Her!! I love the idea of your alter on the desk. And thanks for the link to the prayer shawl site. I’m definitely checking that out. Wow, Alice, you’ve had many experiences! I really enjoyed learning so much about you and the idea for your latest novel. Thanks, June. Appreciate your stopping by. I seem to have time to write blogs for others while my blog is neglected.